It’s shaping up that Penn State’s secondary might feel a lot like the Lone Star State in a couple of years. With rising senior legacy safety prospect Isaiah Humphries of Sachse, Texas having committed to the Nittany Lions on New Year’s Eve, Penn State added another defensive back pledge from the football rich state on Wednesday morning, when three-star corner Trent Gordon of Manvel High School announced he would become 12th member of the Big Ten champion’s 2018 recruiting class in a video he posted to Twitter. “No excuses. Achievement. Never underestimate the heart of the champion. Winners never quit, and quitters never win. I play to win,” Gordon said on the video that showed footage of him working out and highlights of him on the field. “The journey continues. The fight has just begun. I won’t let you down. Gordon completed the video by taking off his T-shirt to reveal Penn State shirt underneath before catching a blue-and-white football. The 5-foot-11, 172-pound corner’s announcement came just two days after he unveiled a top 10 of Penn State, Michigan, Oklahoma, Tennessee, UCLA, LSU, Florida, California, Texas A&M and Duke. Gordon had been trending the Nittany Lions’ direction since visiting University Park with his family on a trip earlier this month that also included stops at Ohio State, Michigan, West Virginia, LSU and Tennessee. He noted in several interviews that the personal connection he developed with the coaches made Penn State stand out. According to Patrick Loney of FightOnState.com, Gordon told him that he didn’t believe he would be taking visits to any other schools. Humphries had been rumored to be considering decommitting from the Lions after he began to get more scholarship offers and wanted to take official visits to other programs, but that apparently has been worked out, at least for the time being. He was among the first to congratulate Gordon on his decision. 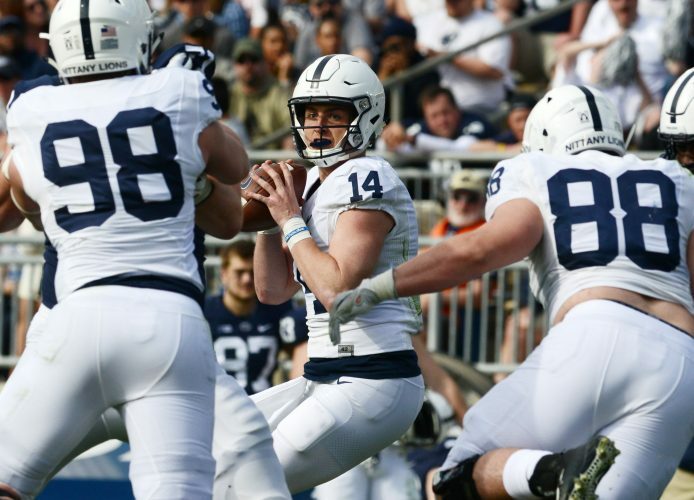 Penn State signed four cornerbacks in February, but a couple of them didn’t fit the mold of tall, long-armed defenders James Franklin and his staff usually covet. Gordon, does, though, and he will bring an edge to him and a reputation as an outstanding tackler from his suburban Houston home. “Gordon looks and plays bigger than his 5-foot-11 listing suggests, and he’s long and lean, giving him plenty of space to add bulk in college,” Scout.com analyst Gabe Brooks said. “Gordon plays for one of Texas’ strongest Class 5A programs and will be accustomed to good competition both in practice and games. He’s a smart player who anticipates where the ball is going, whether defending the pass or the run. Gordon closes fast and can deliver the big hit. Those traits could also translate as a blitzer at the next level. Mostly playing safety, Gordon made 81 tackles, broke up 10 passes, had two interceptions, two fumble recoveries and forced fumble and a sack in 2016 as Manvel went 13-1, advancing to Texas’ Class 5A Division I quarterfinals. Gordon also runs the hurdles and sprint relays for Manvel’s track and field team, which is one of the best in Texas. The Nittany Lions currently have the second-best recruiting class in the country. Penn State is expected to sign around 20 players next February.